Supercharge the office with affordable color and fast two-sided performance. Manage your budget with professional-quality color at up to 50% less cost per page than lasers with the HP OfficeJet 6978 wireless printer. Set the pace for success with rapid print, scan, and copy speeds. Save paper and conserve resources—consume up to 50% less paper with automatic two-sided printing. Make scanning effortless and accurate. Never turn a page again when you need to scan two-sided documents with this all in one printer. Main functions of this HP all in one printer: copy, scan, fax, wireless printing, two-sided duplex printing and scanning, color touchscreen, automatic document feeder, plus more. Easily print when and where you need to from your smartphone, tablet, or notebook PC. Easily print when and where you need to from your smartphone, tablet, or notebook PC. Get convenient Mobile printing capability options and mobile setup. Connect the way you want to with Ethernet and wireless networking. Download the HP Smart app and easily set up this wireless printer, scan documents with your camera, and print from social media or the cloud, such as Google Drive and Dropbox. 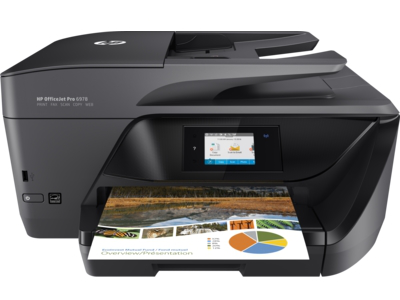 HP OfficeJet Pro 6978 is ideal for the home office or small workgroups that need professional-quality, affordable color with powerful productivity and fast functionality. Save time by sending scanned documents or photos directly from your printer to email recipients; never turn a page again when you need to scan two-sided documents. Print speed of up to 20 pages/minute (black) and monthly duty cycle up to 20,000 pages. Use Original HP 902, HP 902XL & HP 906XL ink cartridges to print up to 2x the pages vs. refills. Paper sizes supported: A4, Letter, 5x7 in, 4x6 in, Legal, 4R, L, Panoramic/10x30 cm, 10x15 cm, 10x15 cm plus tab, 13x18 cm, 4x8.5 in, 13x18 cm. What's in the box: HP OfficeJet Pro 6978 All-in-One Printer, HP 902 Setup Black OfficeJet Ink Cartridge (~265 pages), HP 902 Setup Cyan OfficeJet Ink Cartridge, HP 902 Setup Magenta OfficeJet Ink Cartridge, HP 902 Setup Yellow OfficeJet Ink Cartridge (CMY composite ~310 pages), User Guide, Setup poster, Power cord, Phone cord. Media Size Statement - 8.50" x 5.50"; Legal - 8.50" x 14"; Letter - 8.50" x 11"; B5 (JIS); Executive - 10.50" x 7.25"; Photo - 4" x 6"; DL Envelope - 4.30" x 8.60"; A6 - 4.10" x 5.80"; Envelope No. 10; C6 Envelope - 4.48" x 6.68"; A5 - 5.80" x 8.30"; A2 Envelope; A4 - 8.30" x 11.70"; Monarch Envelope; C5 Envelope - 9" x 6.68"; Index Card - 5" x 8"; Photo-2L; 3.50" x 5"
5 Savings claim is based on HP Instant Ink Service plan price for 12 months using all pages in plan without purchase of additional pages compared with the cost per page (CPP) of the majority of color inkjet printers <$399 USD, market share reported by IDC CYQ3 2015. CPP comparisons for standard-capacity inkjet supplies are based on estimated street price and page yield as reported by gap intelligence AiO Weekly and IJP Weekly Report 12/13/15. Actual savings may vary depending on number of pages actually printed per month and content of pages printed. 6 Wireless performance depends on physical environment and distance from access point and may be limited during active VPN connections.